We leave the vile nest and return to the front of the castle. By comparison, it is beautiful here. The thorns have receded so that we can walk more easily. The flies are gone and the vultures all seem to be back at the nest now. I breath more easily, tempted to rest a bit. But His voice draws me back to what we are about. “You cannot see what these vultures are about because you do not really desire it. Your flesh does not want to change, does not want you to see.” There is firmness, but no condemnation in His tone. “What can I do? I want to see, I want to understand.” I protest, feeling torn between the desire to quit and the desire to press through. His words hang heavy. I hate that word, rebuke. I feel ill at its mention, the intense pain and humiliation of His last rebuke of me are not far off in my mind. I do not want to go there again. Yet, that is not what He has offered. He has not said He would rebuke me, but that He would teach me to rebuke my own flesh, to bring it under submission to Him. All this distracts me and I am tempted to wander. I look about, remembering that the birds are gone from here now and for a moment consider what it would hurt to just clean up the front of the castle and leave the birds alone. I remember the stench and those awful calls. No. No! I do not want that anywhere near me. The fear of those awful creatures is worse than my fear of His rebuke and the pain I know it will bring. I cannot allow those things to remain, no matter what He requires of me to do it. I am thankful at least this part is easier for me. I remove all that He has given me, setting aside the robe and sandals. The gravel is sharp on my feet, reminding me of the protection He has given me throughout this place. I hand Him the belt, wondering in the back of my mind whether He will hit me with it. But He sets it aside, reaching out to me, to draw me closer. I give Him my hand and step close to His side. He begins to show me how to rebuke my flesh into submission to Him. Finally, I see the one legged vulture afar off and in my mind’s eye, yet another picture emerges. 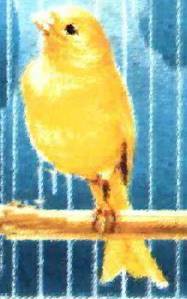 I see a small yellow canary with one leg that we had as a pet when I was a tiny girl. The bird sang very sweetly, but was always in a cage. I watched that bird often and never saw it fly. I longed to touch it, stroke it gently. It was trapped in that cage where on one could touch it. I seem to hear my mother’s voice saying that the cage kept the bird safe, so no one could hurt it. Then I hear that little girl say to herself, I want to be safe too! No one must touch me. So a cage is built around her, keeping her from the touch of others, but like that bird, she is trapped, too, and cannot fly. I am trapped and cannot fly! No one must touch me! No one can touch me! I cry out without realizing it. Waves of emotion wash over me, grief, fear, perhaps anger. I sob without words to speak for a long time, seeing the trapped bird so clearly in my mind. “I want to be free! Papa, I want to be free!” I am on my knees now, huddled into a little ball, rocking. “ I want to get out of this cage.” But how do I get out? Raising my head slightly, I see the cage has fallen away and the canary is flying free, singing. I watch as it soars over the garden, out of view. A moment later, though, I see the little girl with the bird sitting on her finger. She is gently stroking the bird with one finger and the bird sings in response. The canary takes to the air again, she runs beneath, ‘flying’ with the airborne creature. As I watch them run, I realize that the thorns have retreated even farther, becoming individual bushes now. Nothing comes to attack—the vultures are gone! “Papa, can we go back to the nest?” I want to see for myself that they are totally gone. He guides me back to the shady side of the castle, but it is a very different place now. The fallen rocks, the nest, the thorns are all gone. The stench no longer hangs in the air, I can breath here. No trace of the vultures is left. All of it is replaced by a familiar magnolia tree! The tree from His garden is here now! Behind it, I can see the water fall is here too, gently flowing and feeding the mote which encircles the inner walls of the castle. In my excitement, I climb into the tree. On a near branch I see a small nest with three baby birds, getting ready to fly themselves. I watch them for a long time, laughing at their antics. The work seems to progress quickly. When we are finished, He bids me to wash in the waterfall. I welcome the opportunity to enjoy the cool waters. As I do, I see the clear waters of the water fall flowing into the moat and becoming cloudy and dark. I fear that this is the next place we must tackle.